Interstate 435 is the 83-mile, two-state beltway encircling the Kansas City metropolitan area. 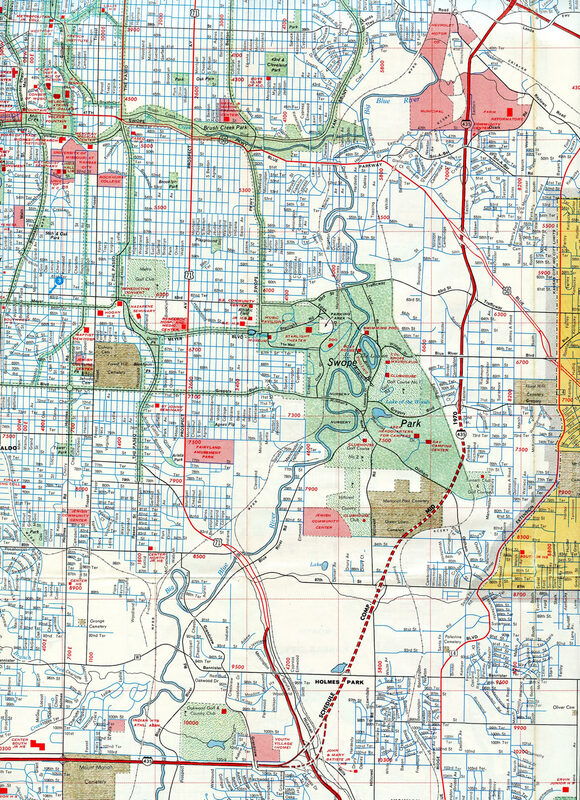 The freeway serves Independence, Lee’s Summit and Overland Park among other suburban cities. 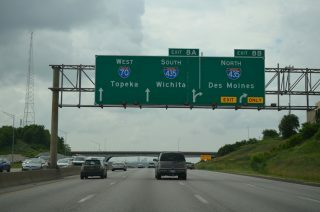 While providing a bypass for long distance travelers north to St. Joseph and Des Moines, and south to Wichita and Joplin, most of the freeway serves commuter traffic. Areas of the north beltway are somewhat rural while I-435 to the southwest, south and east of Kansas City are suburbanized. 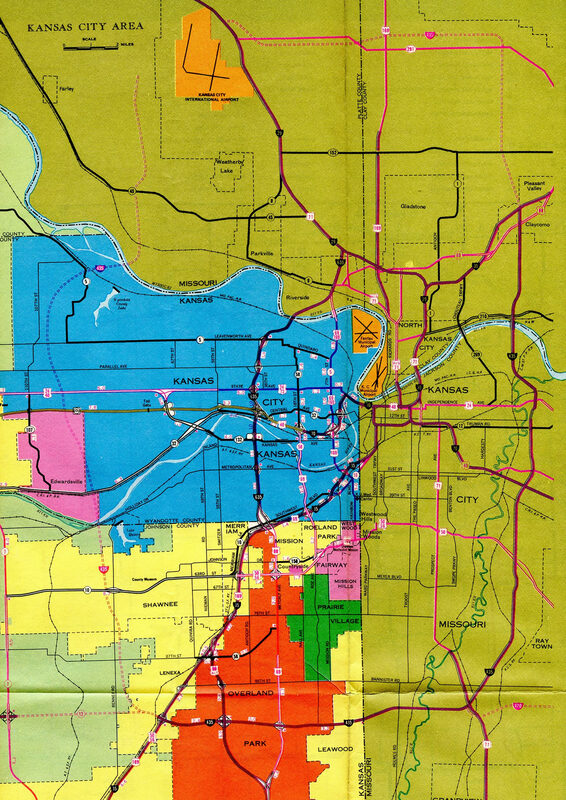 The northwestern quadrant overlaps with Interstate 29 for 3.1 miles by Kansas City International Airport (MCI). AASHTO designated the Kansas City beltway as I-435 on June 23, 1969. The route appears on the Missouri Official Highway Map by 1964, but only as an east side bypass between I-35 near Lenexa, Kansas and I-35 at Claycomo, Missouri. Opened to traffic by 1967, the initial section of freeway ran east from I-35 to U.S. 69 in Overland Park, Kansas. The freeway north and east to Missouri 78 (East 23rd Street) at Blue Summit was completed by 1970. The original I-435 alignment east of I-35 was finished by 1975, with a full cloverleaf interchange at the west end with a local road tieing it into Pflumm Road to the south, and a semi directional-T interchange at Claycomo to the north.1 U.S. 50 was relocated to follow I-435 west from Lee’s Summit, Missouri to Overland Park, Kansas as conditionally approved by AASHTO on June 29, 1978. The Grandview Triangle Interchange, where Interstates 49, 435, 470 and U.S. 50 and 70 come together, was upgraded during roadwork from fall 2000 to May 2008. $300-million in construction focused on expanding the U.S. 71 mainline by three lanes per direction, adding two lanes for the continuation of I-435 east, and shifting the left-hand ramp from I-435 east to I-49 and U.S. 71 south, and I-470 east to the right. Interchanges were also revamped along I-49 & U.S. 71 to the south at Blue Ridge Boulevard, Red Bridge Road and Longview Road. The $600-million Johnson County Gateway project focused on upgrading Interstate 435 between West 87th Street and U.S. 69 in the Overland Park area. Phase 2 of construction rebuilt the beltway from K-10 eastward while Phase 3 will extend work northward to 87th Street at a date to be determined. Interstate 435 from the Grandview Triangle Interchange northward to Gregory Boulevard near Swope Park was completed by mid 1970. 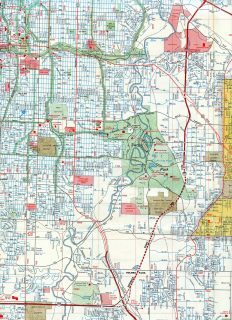 Further extension of I-435 north to NE 48th Street (Exit 54) followed by late 1971. Interstate 29 & U.S. 71 south combines with Interstate 435 at this semi directional T interchange in southeast Platte City, Missouri. Photo taken 06/18/15. The initial stretch of I-435 opened west of I-35 in Kansas was the section from Midland Drive (Exit 5) to K-32 (Exit 9). This was shown as complete on the 1981-82 Kansas Official Highway Map. Interstate 435 west at Interstate 70 in Kansas City, Missouri. Photo taken 06/18/15. Construction between 2010-12 both expanded I-70 at the cloverstack interchange with I-435 and added ramps from the beltway to adjacent U.S. 40. Beyond I-35 and Pleasant Valley, Interstate 435 reenters Kansas City ahead of the Missouri 152 freeway. The beltway combines with I-29 in 19 miles by Kansas City International Airport (MCI). Photo taken 06/19/15. Interstate 35 leads southwest to North Kansas City while I-35 northbound serves commuters to Liberty and the separation with U.S. 69 to Excelsior Springs. Missouri 110 (Chicago Kansas City Expressway) accompanies the freeway north to the U.S. 36 expressway at Cameron. Photo taken 06/19/15. Passing by the Worlds of Fun theme park, Interstate 435 advances 2.5 miles north to meet I-35 and U.S. 69 at Claycomo. Photo taken by Eric Stuve (11/30/02). An arrow per lane (APL) sign replaced this set of I-35/435 overheads preceding the NE 53rd Terrace overpass at the Maple Park community along Interstate 435 north. Photo taken by Eric Stuve (11/30/02). Exit 52A departs just ahead of the directional interchange with Interstate 35 for U.S. 69 through Claycomo. U.S. 69 merges with I-35 north through Pleasant Valley after the Ford Kansas City Assembly Plant nearby. Photo taken by Eric Stuve (11/30/02). Exit 53 utilizes the original semi-directional T interchange from the former north end of I-435 at Interstate 35. Photo taken by Eric Stuve (11/30/02). Interstate 435 trends southeast from the Missouri 152 freeway to nip the western corner of the Pleasant Valley city limits as Exit 52 departs for I-35 south and adjacent U.S. 69. Photo taken 06/19/15. Exit 52 leaves I-435 south ahead of bridges over Shoal Creek. There is no access to I-35 north to Liberty, with the Missouri 152 expressway providing a direct route to the Clay County suburbs from Exit 49B. Photo taken 06/19/15. Original button copy sign for Interstate 435 (Exit 12A) on Interstate 35 south. Due to the angle which the two freeways converge, there is no direct access to I-435 north. Motorists headed to the beltway north were directed to use Missouri 152 west previously from Liberty. Photo taken by Eric Stuve (11/30/02). Exit 12A separated from the I-35 mainline for Interstate 435 south. The beltway proceeds 10.5 miles south to meet Interstate 70 by Arrowhead and Kauffman Stadiums. Interstate 35 continues 9.6 miles southwest to combine with I-70 west along the Alphabet Loop encircling Downtown Kansas City. Photo taken by Eric Stuve (11/30/02). Interstate 35 curves northeast into the village of Claycomo on the one half mile approaching with the Kansas City beltway. Upcoming Exit 12A serves both I-435 south to Randolph and Independence and local access to U.S. 69 for the Ford Kansas City Assembly Plant. Photo taken 06/18/15. A directional interchange (Exits 12A/B) joins I-35 and the south end of Missouri 110 (Chicago Kansas City Expressway) with Interstate 435. The CKC overlaps with freeways and U.S. highways from Kansas City to Interstate 290 (Eisenhower Expressway) into Downtown Chicago, Illinois. Photo taken 06/18/15. Interstate 35 and U.S. 69 switch sides northward through Claycomo, where they both meet Interstate 435. Photo taken by Eric Stuve (11/30/02). Control cities on the Missouri side of the Kansas City beltway use destinations of Interstates 29, 35 and 70. The eastern half of the beltway uses St. Louis for the connection with I-70 east through Blue Springs. Photo taken by Eric Stuve (11/30/02). Former button copy signage along I-35 north for Exit 12A and Interstate 435 south. Photo taken by Eric Stuve (11/30/02). A directional ramp (Exit 12B) leads drivers onto Interstate 435 north from Pleasant Valley to northern reaches of the Kansas City limits, Smithville and MCI Airport. Photo taken by Eric Stuve (11/30/02). Interstate 435 turns east toward Interstate 35 (Exit 83) at Exit 1) with K-10 west to Lawrence. K-10 east runs along side I-435 to end at I-35. Photo taken 11/03/16. The Johnson County Gateway Project added a collector distributor roadway starting within the exchange at K-10 to separate all traffic bound for Interstate 35 from the beltway mainline. Shields for U.S. 50, 56 and 169 reference the various freeway overlaps the trio make through Lenexa and Overland Park. Photo taken 11/03/16. 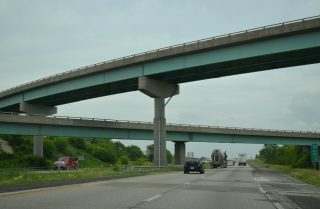 Interstate 435 maintains three eastbound lanes through the three-wye interchange with K-10, and four east across Interstate 35. The c/d roadway extends 1.4 miles to separate ramps for I-35. The beltway switches to east/west cardinal directions at this point. Photo taken 11/03/16. Two lanes of traffic join the c/d roadway for Interstate 35 from K-10 east adjacent to the lowering left-hand ramp for Lackman Road. Photo taken 11/03/16. Progressing east along the c/d roadway to Interstate 35. I-35 overlaps with U.S. 169 southward to Olathe and with U.S. 56 west to the suburb of Gardner. Both routes accompany the freeway north to Shawnee Mission Parkway. Photo taken 11/03/16. Interstate 435 formerly expanded to five lanes from the merge with K-10 east to Exit 1A with Lackman Road. The Lackman Road off-ramp was relocated to a new c/d roadway during the Johnson County Gateway project of 2014-16. Photo taken by Eric Stuve (11/30/02). Right in right out (RIRO) style ramps formerly connected I-435 with adjacent roads linking the beltway with Lackman Road. Lackman Road serves industrial and business parks in southern Lenexa. Photo taken by Eric Stuve (11/30/02). Shields for U.S. 56 and 169 posted separate from guide signs reference the overlaps of both with I-35. U.S. 50 also navigates southwest along I-35 to Emporia and east along I-435 through Overland Park. Photo taken by Eric Stuve (11/30/02). Back to back lane drops previously took place along I-435 east leading to Exit 83. The forthcoming interchange with Interstate 35 is the same design now, but the ramp geometry was improved during the Johnson County Gateway Project with new flyovers added for east to north and west to south. Photo taken by Eric Stuve (11/30/02). Exit 83 partitioned for the respective ramps to Interstate 35. I-35 leads 178 miles southwest to Wichita. 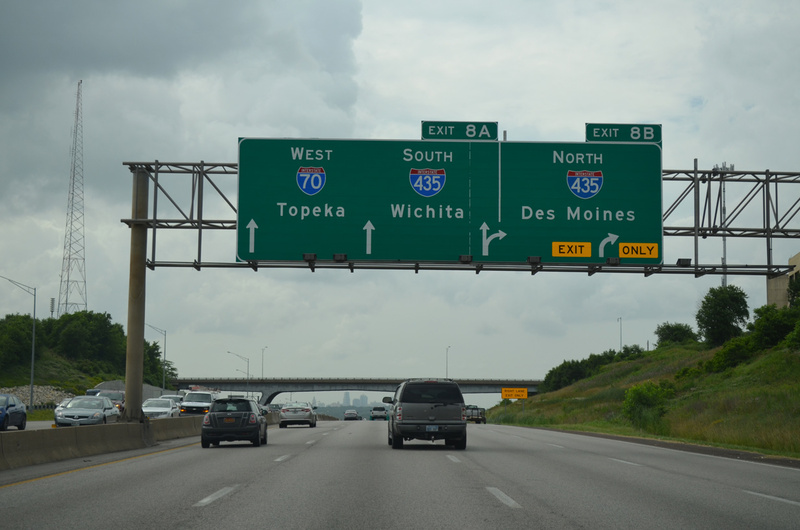 Northbound travelers taking I-35 will enter Kansas City, Kansas in ten miles, and reach the Iowa state capital in 255 miles. Photo taken by Eric Stuve (11/30/02). Passing under the Quivira Road overpass, one mile east of the cloverstack interchange (Exit 83) with Interstate 35 on I-435 & U.S. 50 west. Photo taken 10/30/16. An array of business parks and industrial areas spread along both sides of Interstate 35 & U.S. 50-56-169 to the junction with Interstate 435. Control cities are not used on the Kansas side of the beltway. Photo taken 11/03/16. College Boulevard spans Interstate 35 north, just ahead of Exit 222A for I-435 east through Overland Park and Leawood. The busiest stretch of the beltway lies between Interstates 35 and 49. Photo taken 11/03/16. Although unmarked here, U.S. 50 parts ways with Interstate 35 north for I-435 east through Overland Park, Leawood, south Kansas City and Lee’s Summit. Photo taken 11/03/16. A loop ramp (Exit 222B) follows for Interstate 435 west and K-10. K-10 constitutes a full freeway west from Lenexa to Lawrence. I-435 turns north through Shawnee to cross the Kansas River at Edwardsville. Photo taken 11/03/16. Interstate 35 carried just three northbound lanes to the Kansas City beltway (I-435). Photo taken by Eric Stuve (11/30/02). Entering the original cloverstack interchange (Exits 222A/B) with Interstate 435 on I-35 north. Photo taken by Eric Stuve (11/30/02). Motorists looping onto I-435 west from I-35 north previously encountered a weaving traffic pattern with subsequent ramps at Lackman Road and the split with K-10 west. Photo taken by Eric Stuve (11/30/02). Angling southwest from the diverging diamond interchange (DDI) with 95th Street, Interstate 35 advances one mile to Exits 222B/A for the Kansas City beltway. Photo taken 10/31/16. Interstate 35 spans Pflumm Road just ahead of Exit 222B for I-435 west to Lawrence and north to I-70 near Kansas Speedway. Photo taken 10/31/16. Construction during the Johnson County Gateway Project relocated the off-ramp (Exit 222B) for I-435 west to improve its curvature and tie it into a new c/d roadway leading west to Lackman Road (Exit 1A) and the K-10 freeway west to Lawrence (Exit 1B). Photo taken 10/31/16. “Triangle traffic traumas will soon fade.” The Kansas City Star, December 13, 2007. “JoCo Gateway Project to Address Bridge Approach Settling Issue Update – NOW COMPLETED!” http://jocogateway.com/joco-gateway-project-address-bridge-approach-settling-issue-update-now-completed/ Johnson County Gateway KDOT project web site. Special Project Advisory. February 9, 2017. Page updated August 7, 2017.